It’s been two weeks now since my accident and I am gradually getting a little bit more movement back each day, but it is hard going. That having been said, if I had broken the leg I guess being in plaster would be an even bigger problem. 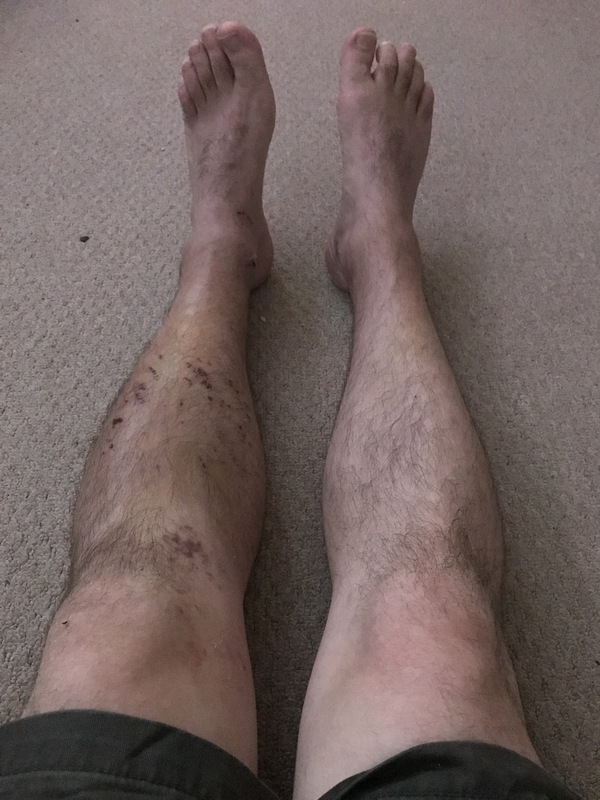 I can walk short distances without crutches, but it’s hard work and very slow going due to the swelling and bruising of the left calf/shin and the right heel. For longer distances I use the crutches, I can get some speed going on them, not as quick as I used to walk, but at least I can still move and get around by myself. 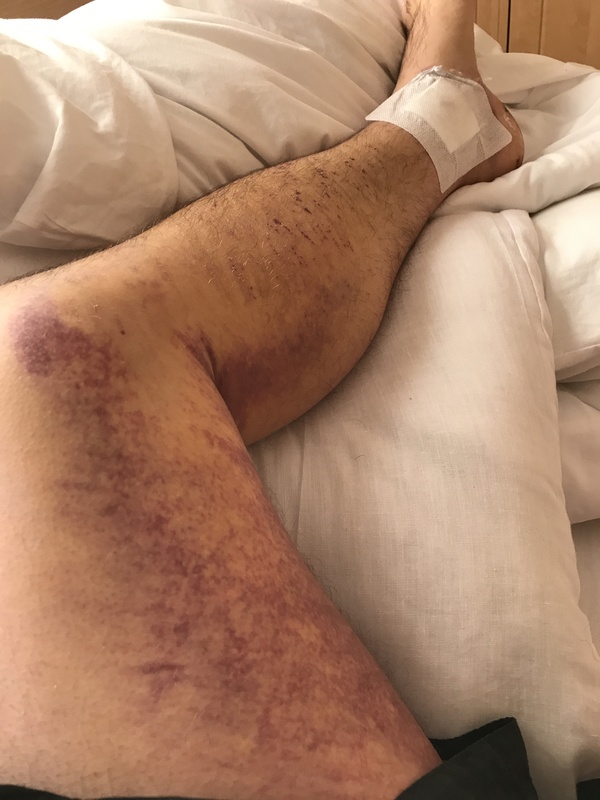 The swelling is going down each day, but I think it will still be a few weeks until it’s gone and I can start to walk normally again. It is actually more comfortable to get up and walk around, get some movement in the muscles, but it takes it toll. I went back into work for a few days this week, but by the end of each afternoon I had had enough. I liked being up and about, but after so long my legs begin to throb and ache quite badly. I’ve had the last couple of days off, but just sitting around is hard, trying to find a comfortable position isn’t easy. Some nights I struggle to sleep because of it being so uncomfortable. To top it off, the skin on my left leg is now so irritable that resting it on anything makes it feel so sore, which makes it even harder to find a comfortable position!!! 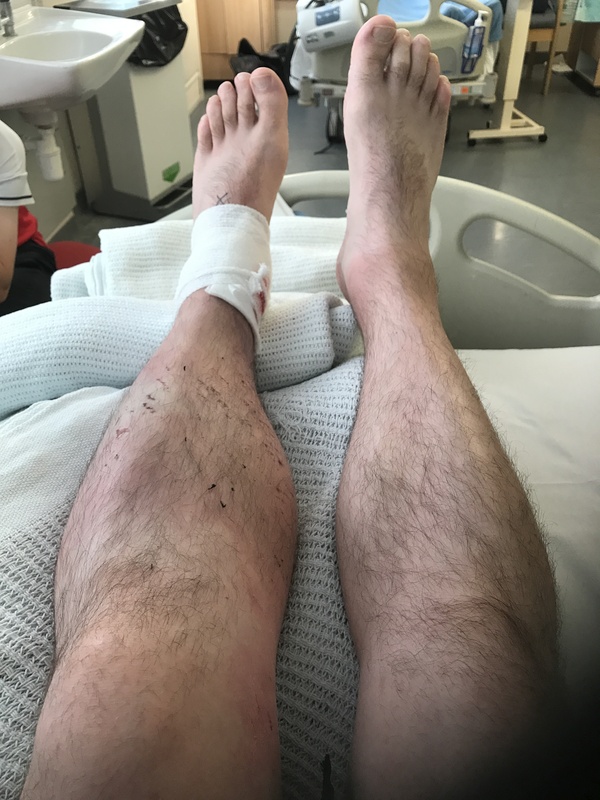 Still, all things considered, this is all just a minor inconvenience, when I think that being run over by a fork lift truck this could have been a whole lot worse, it should have been a whole lot worse, my God was definitely looking out for me that day. It’s not going to be an overnight recovery, I know that, but I keep taking it day by day, doing a little bit more, but being careful not to over do it. This entry was posted in Faith, Ramblings and tagged Accident, Christ, Faith, Get Back Up, God, Grace, Hope, Jesus, Praise, Recovery, TobyMac on August 18, 2017 by waynemali. Today has been another long day. I got up at 5.20am, left the house with the intent of walking for 5.5 miles, it looked like it had rained over night, which I thought would be good, as it was so cold yesterday evening I though the pavements would be iced over, well my road was ok, but round the corner was like glass and as my trainers that are only three months old have no grip, they have done over a thousand miles, I was all over the place, so I turned back early with only 3.5 miles completed. At 8am it was off to Hatfield near London, today was grading day for some of my students taking their Black Belts. Firstly we had to get through 3 hours of training, my first full 3 hour session since my sobriety, well I’m glad to say it went well, I felt good, some of the old magic is returning, although I may be feeling it in the coming days. Four of my young students were grading, whilst I sat on the sidelines, unable to drive them on, it was up to them now. Two of the young lads had tried before hand, but were unsuccessful once again, they’ve both improved greatly, but just didn’t quite have enough on the day, a shame, but these things happen, I myself failed twice before I finally passed on the third time lucky. The youngest of the four was attempting it for the first time, he did well, he passed two thirds of his grading, but has to retake the other part at a later date. All three did well, we’ll keep working hard and try again in a few months. The fourth student, well he’s a real trier. He’s been with me a number of years and well he’s not the most naturally gifted students, he’s struggled along, he’s had setbacks but always picked himself up and carried on. He’s tried on four previous occasions and failed each time, but he’s always pushed on after each failure and worked hard to improve. Well today was his day, he finally did it, he finally achieved his dream and he deserves it. The look on his and his father’s faces when the results were given said it all, the relief and the joy, it was priceless. And me, well I stand on the side lines as proud as any instructor can be, young Ryan deserves his day of glory, he deserves to taste success and deserves to wear that black belt. Without any disrespect to any of my other students, but it is always more satisfying when one of less gifted of students just keeps persevering, just keeps plugging away until they finally get to wear that black belt around their waist. I couldn’t be more proud of anyone today, Ryan you deserve it more than anyone, well done. This entry was posted in Karate and tagged Black Belt, Celebration, Get Back Up, Karate, Kids, Proud, Proud Instructor, TobyMac on December 1, 2012 by waynemali.